A Thanksgiving feast at Shadow Run Vineyard, Paso Robles, includes traditional and non traditional dishes and of course, plenty of wine. Fall is here and it is time to celebrate the end of a successful harvest season and begin to prepare for the holidays ahead. Thanksgiving at Shadow Run Vineyard is a time for rediscovering beloved family recipes and experimenting with new foods and flavors. Our feast will include traditional turkey with dressing, cranberry chutney, buttery smashed potatoes, yams roasted with olive oil, sage and fennel, floury white rolls, and pumpkin pie with pecan pastry crust. Mounds of Grandma’s cookies (walnut, cinnamon, and ground raisins topped with a coffee icing) will be saved and savored for day after snacking and late night cookie raids. But our Thanksgiving menu, like our family, celebrates diversity and so our meal will start with Tom Kah Gai, an aromatic Thai soup that pairs beautifully with our 2012 Melissa, a white Rhone blend of Viognier and Grenache Blanc. Equally scrumptious with the turkey and dressing or our Thai soup is our 2010 Shadow Dance, a Grenache that is defined by the ripe red cherry and juicy raspberry flavors of this varietal. 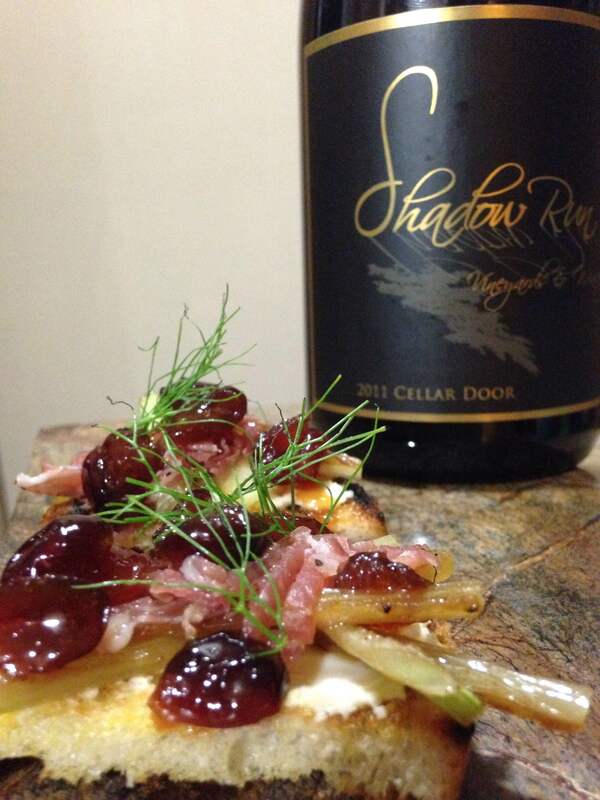 We will serve 2011 Cellar Door, an estate grown Syrah with Zullo’s appetizer. This Syrah is a velvety, concentrated wine, voluptuous on the palate, beautifully balanced with lush flavors of mocha and blackberry. For more information about the recipe or Zullo’s catering, contact Jordan Zullo at 805 423-0988. 1. Cut stalk off of the fennel and remove fronds from the stalk. Cut fennel bulb in half. Make sure you cut out the bottom of the fennel which will be in the bottom center (this piece is not edible). Julienne fennel vertically to get nice fanned pieces. Dust with sugar and set aside. 2. Slice the French baguette horizontally in 1/8 inch slices. Place the cut pieces on a baking or sheet tray. Drizzle olive oil until you get a light coating on both sides of the bread. Lightly sprinkle salt and pepper on both sides of bread. 3. In small sauce pan heat 1 tablespoon of oil until hot. Place onion in hot oil and lower heat. Sweat the onion for about 2 minutes or until translucent. Add orange juice, sugar, and dried cranberries into sauce pan and reduce until you get a thick sauce. 4. Heat a grill skillet, or you can use a grill for the baguette slices. If you don’t have either you can place the crostinis in the oven at 375 degrees for 8-10 minutes or until golden brown. If you do have a grill or grill skillet get the pan really hot. Place crostinis on pan and get nice grill marks on the bread. One you have grill marks, flip the piece of bread over and shut off the stove. The crostinis can sit in the pan until you are ready to use them. 5. Cut the Coppa in really thin slices horizontally. 6. Heat a sauté pan and add olive oil. Make sure the oil is extremely hot. Place the julienned pieces of fennel in the hot pan. Cook on each side until caramelized. Remove from heat and place on plate. 7. Now you are ready to make the appetizer. Spread the Saint Andre cheese on the grilled crostini with a butter knife. Place 2 pieces of fennel on top of the cheese. Place a pinch of the thinly chopped Coppa on top of fennel. Drizzle the Cranberry Citrus Gastrique making sure you get a few rehydrated cranberries on top of the meat. Use the fennel fronds as garnish. Repeat until you have enough for your party! 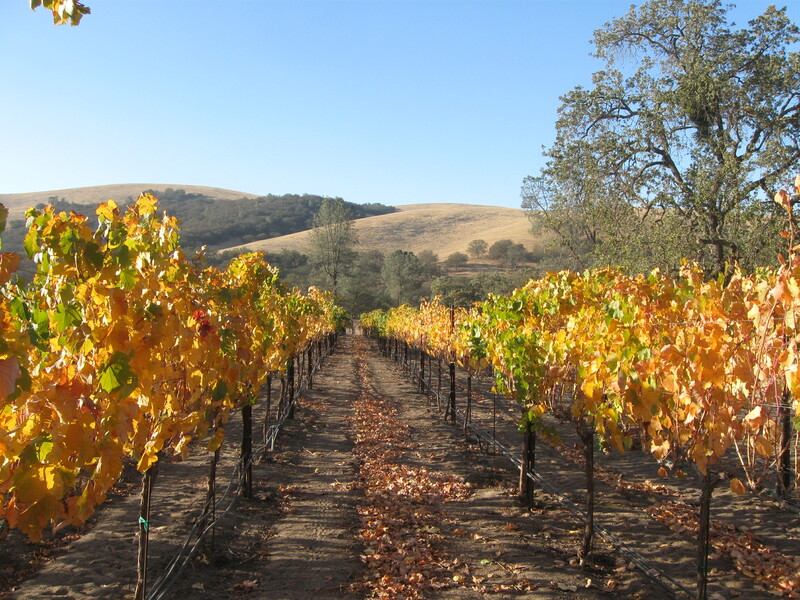 Happy Thanksgiving from the Back Roads Wineries of Paso Robles – We wish you and yours the most joyous of holidays shared with family, friends, good food and wine.